San Francisco Opera opened its season with two of the most famous one-acts of verismo opera, which are often presented together: Cavalleria Rusticana and Pagliacci. In a well-considered version of these two operas, production and set designer José Cura linked the two operas by placing them in the same neighborhood of Buenos Aires and interweaving the characters. Cavalleria opens the evening’s performance. As the day dawns in the colorful streets of La Boca, a neighborhood of working-class Italian immigrants, a man sweeps the streets, a young woman restlessly waits for her lover, lovers kiss framed in shuttered windows and a man smokes a cigarette leaning against the closed doors of café. The waiter of the café arrives to open up, and carries chairs and tables out to the street. Players from a circus arrive to distribute flyers. In the following opera, this waiter will be Silvio, the lover of Nedda, the Columbine of the circus players in Pagliacci. Similarly, Pagliacci will open with a funeral procession with Santuzza, the fallen woman of Cavalleria, trailing behind, now a hefty seven-months pregnant. 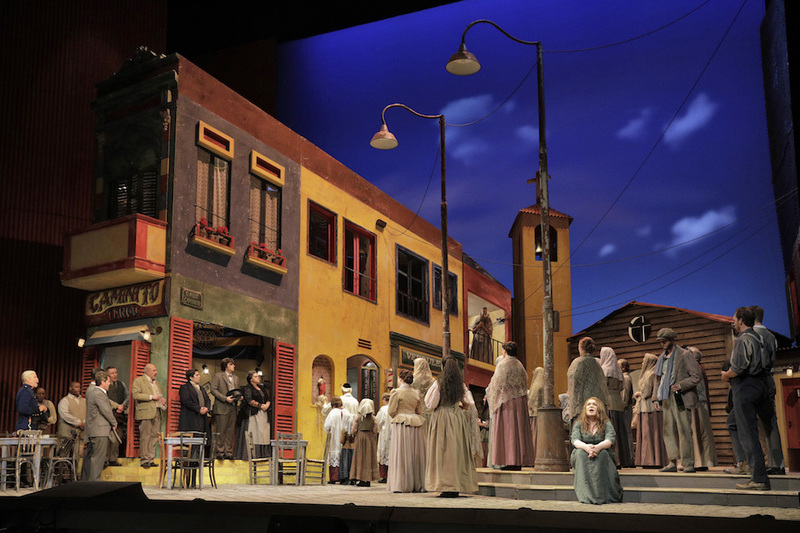 The street scene from “Cavalleria Rusticana” with Ekaterina Semenchuk, seated on the right. Photo by Cory Weaver. The intermingling works exceptionally well, tightening not only the “realism” of the verismo operas but reinforcing the codes of honor that drive the characters and action of the operas. It forms a coherent world of culturally knit individuals, which reinforces the performance’s feeling of elemental endurance. No matter the extremity of emotion or the death of individuals, women will still shake out sheets every morning at their windows, the priest will waylay delinquent children and send them to mass, men will drink and chat at the café and lovers will flirt. The combining of two-into-one also allowed the audience to contemplate at length Cura’s brilliantly vibrant sets, with their ochre and green buildings, red shutters and ultramarine sky. Adding to the lushness was Daniele Callegari’s conducting, which favored a sweeping sound but one that never drowned the singers. The more delicate sounds of the orchestra, like the harp, were also clearly enunciated. And the orchestral intermezzo and introductions were clear and all-Italian, supporting the emotional compositions of Mascagni and Leoncavallo. Only one singer played a lead in both operas, Dimitri Platanias, who sang Alfio, the jealous husband who kills the philandering Turiddu in Cavalleria, and Leoncavallo as the Prolog and Tonio, the wicked clown, in Pagliacci. A baritone, he seemed most comfortable in the Prolog and rather forced in the other roles. Tenor Roberto Aronica sang Turiddu with forthrightness and intensity, his was not the most sympathetic of roles, though he sang his plea that Mama Lucia take care of Santuzza with an equally robust quality. Similarly, Marco Berti, who sang the betrayed Canio in Pagliacci, was more vibrant than sympathetic. Intensity and a warm beautiful tone characterized Ekaterina Semenchuk’s portrayal of Santuzza. Used by Turiddu to evoke jealousy in the married Lola and then abandoned by him when Lola responds to his seduction, Santuzza is both betrayed and denied. Lola was sung and acted seductively by soprano Laura Krumm. Lianna Haroutounian sang Nedda, the Columbine who would escape Canio, a jealous and possessive Pagliaccio, with charm and a touch of fear. Mamma Lucia was sung assuredly and with many an Italianate shrug by mezzo Jill Grove. Baritone David Pershall sang Silvio, Nedda’s lover, his beautiful tone seemed a little erratic on the afternoon I attended, but his acting was appealing and it always helps to be good-looking. Amitai Pati, the second-year Adler Fellow, put in a gracious and wonderful performance as the clown Beppe in Pagliacci. Cura’s production is definitely pleasing. Jose Maria Condemi, also born in Buenos Aires, was the director of this revival. His staging is detailed, full of stage business, and overall entertaining. The dance fantasy sequence under red lights in Cavalleria Rusticana was choreographed by resident choreographer Lawrence Pech and danced with sultry fire by Alexandra FitzGibbon and Jekyns Peláez, a peppery little plus for the opera. Previous Previous post: Long live Donizetti’s fiery Queen!